Sometimes a TV show grabs hold of you and won’t let go. I settled down in front of my computer last Sunday evening to write a column about how the amazing Ken Burns and Lynn Novick film “The Vietnam War,” broadcast over the course of ten days on PBS, had affected me. I wrote about how powerful and disturbing and enlightening and horrifying the show was. I wrote about how it brought back memories of things I wanted to forget. The torture of American POWs. The My La Massacre. Kent State. Napalm and Agent Orange. Body counts. I wrote about things I learned that I never knew before. The complex history of French Indochina. How photojournalists managed to capture the iconic images that encapsulated the beauty and the horror of Vietnam. The myriad ways our leaders lied to us. I wrote about the music that defined my generation’s perception of the war. “Eve of Destruction” by Barry McGuire. “Turn Turn Turn” by the Byrds. “Ohio” by Crosby, Stills, Nash and Young. “The Sound of Silence” by Simon and Garfunkel. “Where Have All the Flowers Gone?” by Joan Baez. “I Feel Like I’m Fixin’ to Die Rag” by Country Joe McDonald. But I got too sleepy to finish the column so I went to bed. I awoke Monday morning to news of the shooting rampage that killed dozens and injured hundreds of people in Las Vegas. And I found myself unable to write any more about Vietnam. Because the nightmare we’re living in now, though different in character, is just as horrific and just as senseless as the nightmare we lived through in Southeast Asia. The worst mass shooting in American history was carried out by a man of my age and race, a man with no criminal history and no indication of mental illness. 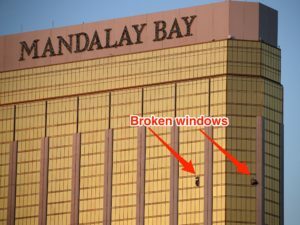 A man who’d checked into the Mandalay Bay Hotel with a staggering cache of weapons and ammunition powerful and sophisticated enough to be used in war. He’s one more in a long line of terrorists whose names fade away as soon as other names take their place. From Columbine to Sandy Hook, from Orlando to Las Vegas, the carnage goes on and on and on. Last week, as the crowd cheered, a candidate for the U.S. Senate from Alabama pulled a pistol from his pocket to reaffirm his support for the Second Amendment. The U.S. House of Representatives is working to schedule a vote on the “Hearing Protection Act,” which makes it easier and cheaper for individuals to purchase gun silencers. Inexpensive kits that make it easy to modify semi-automatic weapons are readily available on the internet. Sometimes the only way I can respond to the madness is to lie in the dark and listen to the Beatles sing “Let It Be,” the song that ended “The Vietnam War” film. It doesn’t fix things. But it helps, just a little.